Students at the Pink Out football game pose for a picture after getting their faces painted in support of breast cancer awareness. 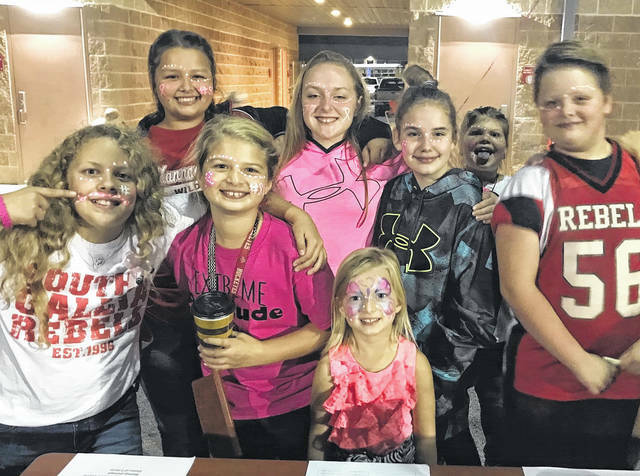 MERCERVILLE — South Gallia High School raised over $1,000 at its Pink Out home football game against Wahama High School on Oct. 13. The National Honor Society coordinated the effort to raise funds through bake sales, face painted, a basket raffle, and t-shirt sales. Over $1,900 was raised throughout the entire event, according to NHS President Riley Sanders. Part of the fundraising included going to elementary schools selling footballs and key-chains and face painting for students at Southwestern and Hannan Trace. The group intends to keep approximately half of the money earned to support the food drive they do during the Christmas season. Community service is an important part of being in the National Honor Society, students said. The $1,000 that will be donated for breast cancer awareness will go to the Susan G. Komen Foundation. NHS at South Gallia has been involved in raising funds through events during October each year for a number of years, seeking to fund research and end breast cancer. There were 16 individuals and businesses which sponsored the event through donations, and student leaders in NHS said they were grateful for the support.